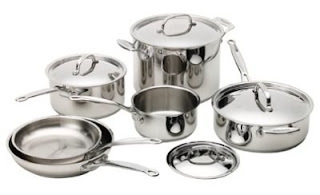 Cuisinart 10pc Cookware Set + FREE 2pc Slicing/Paring Prep Set ($50 value): $99.99 w/ Free Shipping, Regularly $149.99! Right now at Amazon, you can get a good deal on the Cuisinart 77-10 Chef's Classic Stainless-Steel 10-Piece Cookware Set AND get a free gift with your purchase! Amazon has its list price as $400, which I thought was a little high, and I was right. The set costs $149 on Cuisinart's site. Amazon is selling it for only $99.99 though, so you're still saving! To make the deal even sweeter, you can get a FREE 2-piece slicing/paring knife set with this purchase. This knife set has a value of $50, so it's a great freebie! To get the gift, you'll have to print out and mail in this rebate form. More info about the rebate is on the product page here. Look for the orange "Rebate Offer". This versatile 10-pc. set lets you cook several dishes at once in portions large and small. Two saucepans, two skillets, a sauté pan and stockpot make preparing a variety of meals easy. This would make a great gift for a cooker in your life, or even yourself!